Finally the nursery reveal that I’ve been dying to share. I had so much fun doing this nursery, it definitely came with its share of challenges for such a tiny room. I did not have a massive budget, so a lot of the items were DIY projects and it was a teeny-tiny space so I had to be very creative with the space layout. I will be sharing some of the DIY projects in the coming weeks. I made changes to the location of the crib and the type of changing station I was using. This was due to some shipping issues with the changing table and a change in skirting thickness. Some small changes were made to the decor but the concept stayed the same. I ordered the wardrobes and crib from Nevada Furniture, stockists of IKEA in South Africa. I made some major changes to the wardrobes, see my IKEA hack here. I placed the name and some other items on top of the wardrobe to add height to them, it just felt more finished to me. The vertical stripes of the floor to ceiling curtains also helped to add height to the room. The shwe-shwe bedding and framed greeting cards above the crib are from Banini Baby, I got the frames from MRPHome. I bought the shwe-shwe mobile from a local market in Sedgefield in the Southern Cape, they are made by a Zimbabwean lady named Janet. I made a crib skirt with some stunning African inspired fabric I found. The most extravagant piece in the room, and my favourite, is the Meyer Von Wielligh lamp, the organic shape of the lamp softens all the straight lines like a tree would do naturally and it is just gorgeous. 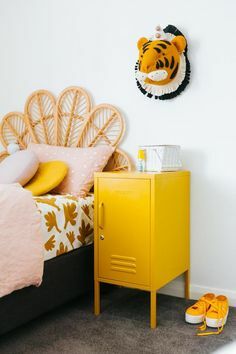 The original IKEA changing table turned into a wall mounted changing station, which now I am glad it turned out this way, it saved so much space and I was able to use the “zoo koekie” wallpaper from Design Kist on the door of the unit. The unit allowed for additional display and storage area too. 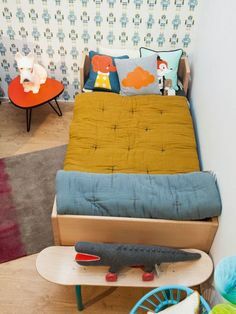 Other storage include: The cloud shelve, book holders, fabric storage bins and glass containers with animals on. They were all DIY projects. I decided to use the Eames replica rocking chair from Chair Crazy as the proportion suited the room size, I must add it is extremely comfortable. I used the Eames replica elephant stool, also from Chair Crazy, as a table for the rocker. I originally made a knitted ottoman in grey, see here, but then MRPHome had these gorgeous ones in yellow and I could not resist. 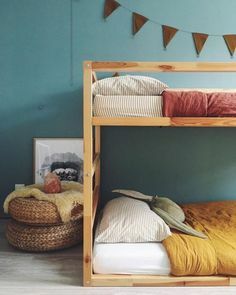 The room was originally designed as a gender neutral room, it is always fun to use lots of colours in a gender neutral room. I sneaked some pinks and blues into the mix, babies do not actually mind. As we did not know the gender of the baby, the name could not be done until the baby was born, I found the letters at De Katte in Grootbrak, WC. As part of the artwork, the letter “D” was given as a gift at the Meet the Baby – shower (as apposed to a normal baby shower before baby arrives) as well as the artwork from MRPHome (love is all you need). The deerhead is from Potbelly, the mushtashe block from Craftersmarket and the boabab tree from CUT – Handmade decor and accessories. I love spending time in this elcectic nursery and it is a hit with baby Demetri.